Tuckahoe Village community is sold out and is not in active development by builder. If you are interested in Tuckahoe Village or similar new home communities, contact us today! Our agents are very familiar with new and newer construction in Chesapeake, and can identify resale opportunities in Tuckahoe Village, as well as builder inventory available in nearby or similar communities in Chesapeake. To view 36 more pictures, interactive maps and the full, detailed description of the Tuckahoe Village community, please Login. 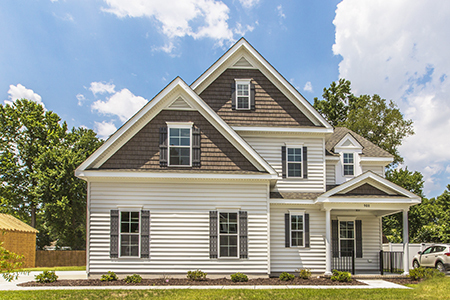 Tuckahoe Village is a new construction home community that offers convenience and style. The builder provides spacious ¼-acre lots giving owners room to play and grow. Located in the heart of the Great Bridge area of Chesapeake, this development is ideal for buyers looking to position themselves in a centralized part of Hampton Roads, VA. The Chesapeake Municipal Center is close by for anyone in the legal or civic industries. Military members may note that the U.S. Coast Guard Finance Center, Naval Medical Center Portsmouth and Norfolk Naval Shipyard are not bad commutes either. Families, singles and couples alike can feel at home in this scenic neighborhood. Each of the 12 single-family houses in Tuckahoe Village come with more than any ordinary new construction home. Typical features of each property here may include: a salt-treated rear deck, frost-free hose connections, professional landscaping, side-loading garage, nine-foot ceilings, gas fireplace with marble hearth, hardwood flooring, chair rail, crown molding, copper wiring, recessed lighting, eat-in kitchen, custom kitchen cabinetry, kitchen pantry, granite kitchen countertops, stainless steel appliances, luxury master bathroom, elongated toilets, dual-zone HVAC system and much more. It seems this new home builder has thought of everything! When buyers purchase real estate in this southeast Virginia community, they get more than just a lovely home; they truly get a wonderful place to live. Homeowners here can send teens to Grassfield High, tweens to Great Bridge Middle and children to Cedar Road Elementary. The outdoor set can enjoy easy access to the Great Dismal Swamp National Wildlife Refuge, Bells Mill Park and the Albemarle Canal. Golf courses are plentiful in this region too! Shops, restaurants and theaters are nearby as well. Interstates are readily accessible, but residents can still live a peaceful life without the sounds often associated with traffic. If you’re looking for a new construction home in Chesapeake, come take a look at Tuckahoe Village; this builder does not disappoint. Send me more information about communities similar to Tuckahoe Village. Our agents gladly offer FREE property tours of Tuckahoe Village, Chesapeake and homebuyer consultations to all serious buyers.